Traditional hand-held brush with soft coco fibres. Suitable for domestic or industrial use..
Versatile and hard wearing brush Originally designed for the cleaning of milk churns but now us.. Traditional household metal dustpan with a wooden handle Suitable for domestic or industri..
Sturdy plastic dustpan with flexible rubber lip. Hand brush with a soft bristle for quick .. Heavy duty 4 row wire scratch brush with heavy duty plain wooden handle, for hand removal of rust..
4 row wire scratch brush with scraper fitted to head. Plain wooden handle, for hand removal of ..
Galvanised Boot Scraper. This galvanised boot scraper comes complete with a brush at both ends ..
Coco Fibre Door Mat 24" x 14" (600mm x 350mm) ..
Short Handled Tar Brush. 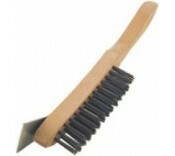 For applying all viscous materials especially liquid tar to finish of..
Long Handled Tar Brush. For applying all viscous materials especially liquid tar to finish off..